Image of the Rectangular Capacitive-disc-fed Patch. 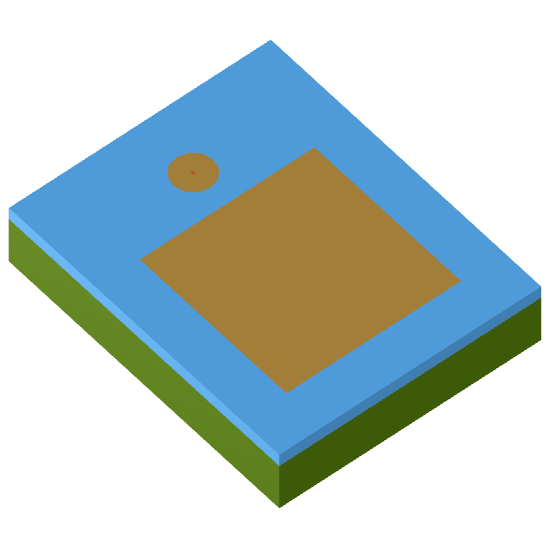 The Rectangular Capacitive-disc-fed patch is a variant of the standard Rectangular pin-fed patch with a unique feed structure (shown in the Antenna Magus design sketches below) allowing much thicker substrates to be used without introducing excessive inductance due to the feed-pin length. This makes much broader operational bandwidths achievable when compared to bandwidths that can be achieved with traditional microstrip patch structures. 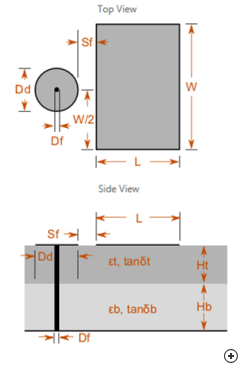 The Antenna Magus design gives the user freedom to design for frequency only or to specify one or both substrates as well. 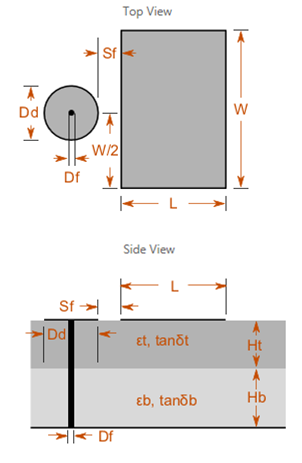 Top and side view sketches with design parameters of the Rectangular Capacitive-disc-fed Patch.